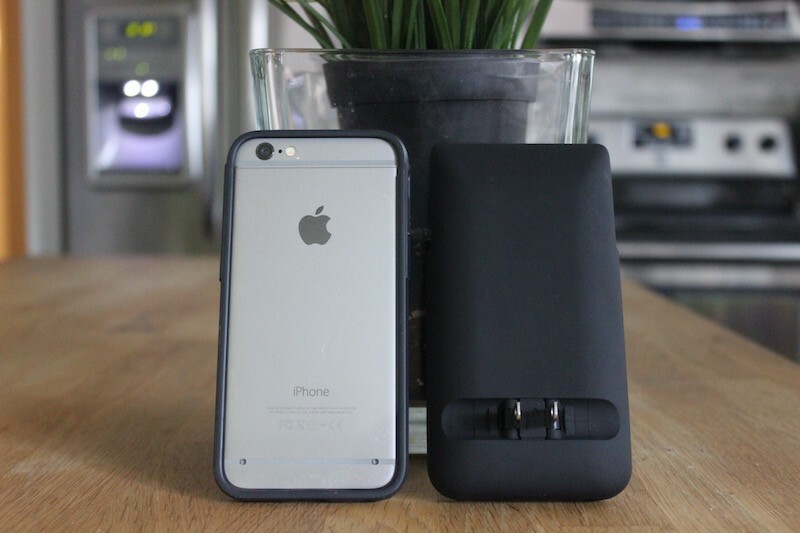 While there are numerous battery cases for iPhones, the Prong PWR Case for iPhone 6 and iPhone 6s differentiates itself with a built-in, collapsible wall charger. 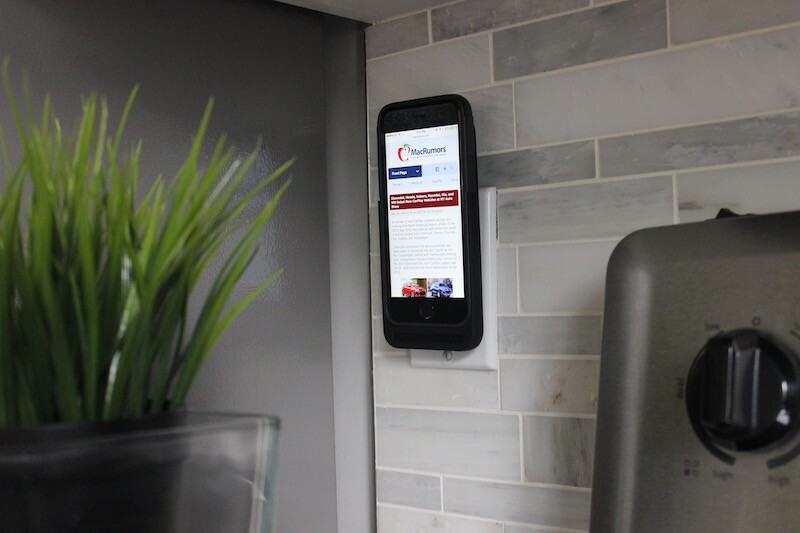 The folding prongs enable you to charge your iPhone by simply plugging it into a wall outlet, making it ideal for work, home, travel, or wherever receptacles are available. Better yet, the PWR Case eliminates the need to have a Lightning charging cable wherever you go for cord-free convenience. But, as with all battery cases, there are important variables to consider before making your purchase, ranging from size and weight to battery capacity and price. Find out how the PWR Case stacks up ahead. 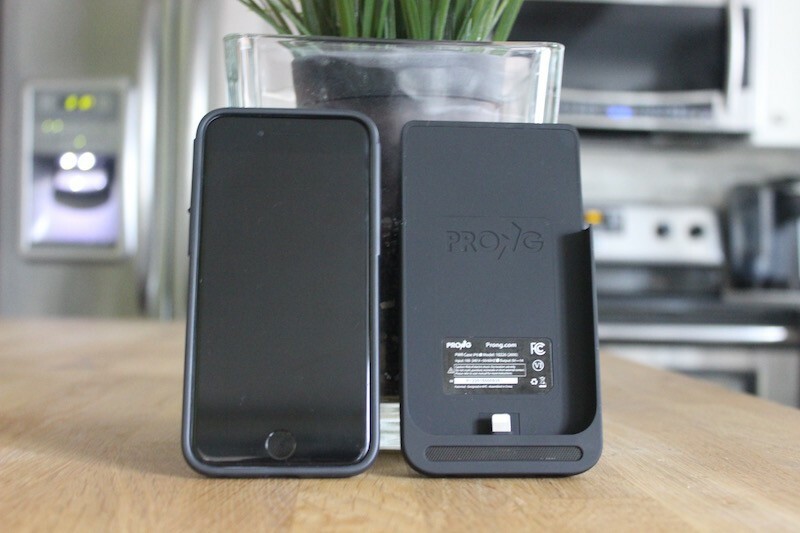 The Prong PWR is a two-piece case consisting of a detachable outer battery pack with rear folding prongs, and a slimmer inner case that resembles a typical silicon bumper for iPhones. You place your iPhone in the bumper case, which slides into the sled-shaped, tapered battery pack with a built-in male Lightning connector. You could technically fit a naked iPhone, or use another case, but the device would fit loosely inside the battery pack and could fall out. The battery pack has a smooth polycarbonate finish that easily collects fingerprints and smudges, especially if you have oily or sweaty hands. The outer case has a small lightning logo between the folding prongs, but otherwise it has no outward-facing branding or markings. Inside the case is a debossed Prong logo and a regulatory label. Meanwhile, the inner case has thermoplastic edges that should offer average protection against minor drops and scratches, and provide added grip that the iPhone 6s so desperately needs. The rear is covered by clear plastic, except for the area between the top antenna band and upper edge of the smartphone, which is exposed to avoid obstruction of the rear camera and dual-LED flash. The side power button and volume controls are both covered by plastic that is easy to press, while there are small pass-through cutouts for the Lightning connector, 3.5mm headphone jack, speaker, and bottom microphone. When the outer battery case is attached, these ports are all covered by the thick polycarbonate shell. The PWR is undeniably thick and heavy, which was likely an unavoidable design tradeoff in order to integrate folding prongs. 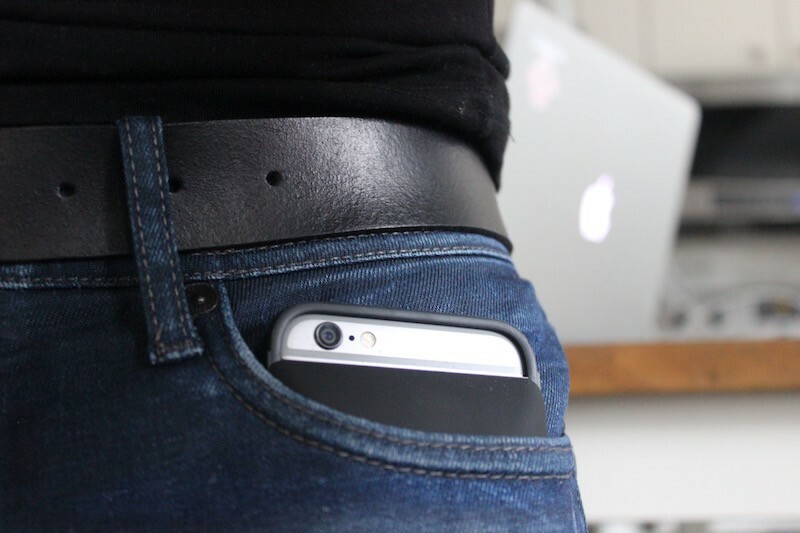 As someone who wears skinny jeans, one of my main concerns with battery cases is pocketability, and the PWR has a noticeably tight fit in my front pocket that leaves little to no room for my keys or wallet. The PWR is also tall, adding about half an inch of height to your device. While the iPhone 6s form factor allows for acceptable one-handed usage, using this case will move you into two-handed usage territory unless you consistently rely on Reachability. If you deliberately avoided a Plus-sized iPhone for this reason, you may find this to be a nuisance. The two-piece design, however, helps to mitigate these problems if you are okay with leaving the outer battery pack behind at times. This half-inch chin contains a wide speaker grille that channels the iPhone 6s audio from the bottom to the front of the smartphone, but the sound quality becomes somewhat muffled and tinnier in the process. There is also a 3.5mm headphone jack opening with an extension adapter included in the box. PWR Case has a built-in 2,600 mAh lithium polymer rechargeable battery pack that delivers on Prong's promise of up to 100% additional battery life. Comparatively, the iPhone 6 and iPhone 6s have 1,810 mAh and 1,715 mAh battery capacities respectively, so the PWR Case provides just over double the milliampere-hours on a full charge. The folding prongs can charge both the internal iPhone battery and external battery pack simultaneously, or just the battery pack. The case took about two hours to fully charge from 0%. The charging level is indicated by four LED lights on the back of the case that can be seen on both the inside and outside of the shell. A square button on the bottom of the PWR Case can be pressed to check the battery pack level and activate iPhone charging from backup battery. Holding the button down for 2-3 seconds will turn off the charging. 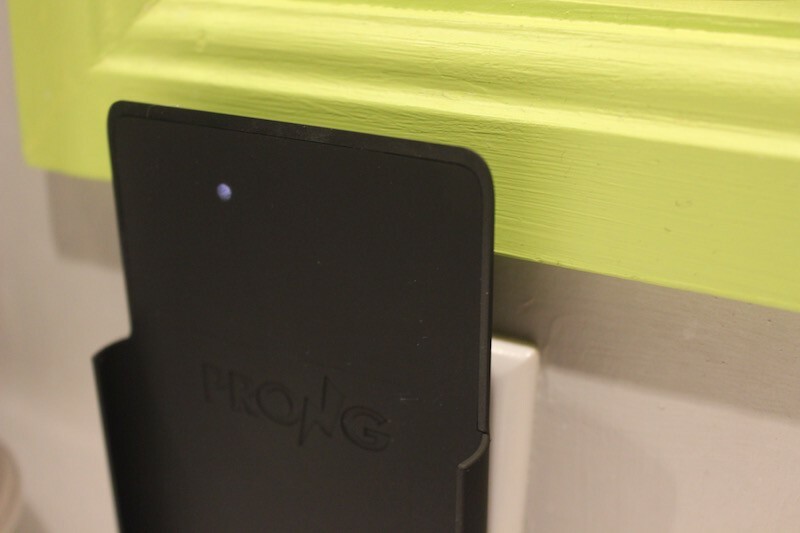 Prong's FAQ details how to reset or put your PWR Case in Sleep Mode. The case delivers output of 5V/1A (5 watts), which is equal to Apple's 5W USB Power Adapter and is the maximum charge rate that Apple allows for iPhone charging accessories. Prong also includes a Micro-USB cable in the box as a backup charging method, or to sync your iPhone with iTunes without detaching the outer battery case. Meanwhile, the case has universal input that works with any 100-240V AC power outlet. However, the folding prongs can only be used with plugs in the United States, Canada, Mexico, China, Japan, and select countries in South America. Elsewhere, a plug adapter is needed. Prong says PWR Case has both UL and FCC safety certification. PWR Case for iPhone 6 and iPhone 6s is available for $99 with a 2,500 mAh lithium polymer battery through Amazon and Prong's website in four colors: black, clear, blue-black, and red-white. A larger 3,500 mAh capacity model is also listed for $119, but it is listed as out of stock on Prong's website. PWR Case is not available for iPhone 6 Plus or iPhone 6s Plus models at this time. At least one contributing factor to the PWR Case's higher price is that it is certified under the MFi Program, meaning the accessory has been designed to connect specifically to iPhone and has been certified by the developer to meet Apple performance standards. MFi accessories are often more expensive than uncertified products. The baseline for comparison should be Anker's Ultra Slim Extended Battery Case, which Wirecutter ranks as the best battery case for iPhone 6/6s. Anker's MFi certified case is just $40, slimmer, and has a larger 2,850 mAh battery capacity, so your decision should primarily be based on whether you think folding prongs are worth 2.5x extra. Many other MFi-certified iPhone 6 and iPhone 6s battery cases without folding prongs are available in the $50 to $130 range, including models from Incipio, iBattz, Odoyo, PowerSkin, LifeProof, Boostcase, OtterBox, and other accessory makers, so Prong's PWR Case is on the higher end of prices compared to the overall market. That's the price difference between Prong's PWR Case and Anker's Ultra Slim Extended Battery Case for iPhone 6/6s. If folding prongs are something you are looking for, the PWR Case is your best bet. Otherwise, consider Anker or other brands. I'm... actually far more interested than I thought I'd be, honestly.